40.3 million people are currently living in slavery. 87% of Afghan women have experienced emotional, physical, or sexual violence. 20% of Cambodian said their first sexual experience was one of sexual assault. Trafficking, slavery, and abuse, are some of the most polarising issues of our time. As statistics currently stand, there are 40.3 million people currently living in slavery, with over two thirds of them in Asia. We work in response to this issue through providing comprehensive recovery to survivors, and by educating communities on how to prevent and recognise trafficking. 87% of Afghan women have experienced emotional, physical, or sexual violence, and 20% of Cambodian women said that their first sexual experience was one of sexual assault. Hagar works to provide individualistic and comprehensive care plans for each survivor of violence in all of our programme countries across the globe. At Hagar, we see the whole journey of the whole person. The Hagar impact is unique, because no one journey or client is the same. Our approach is to provide individualised care for every survivor we come into contact with, which to date, stands at more than 17,000 people. We don’t have a set time frame on how long we work with a client for; we do whatever it takes for as long as it takes. We don’t just work at the individual level, but at a systemic level to see change in the countries in which we work. 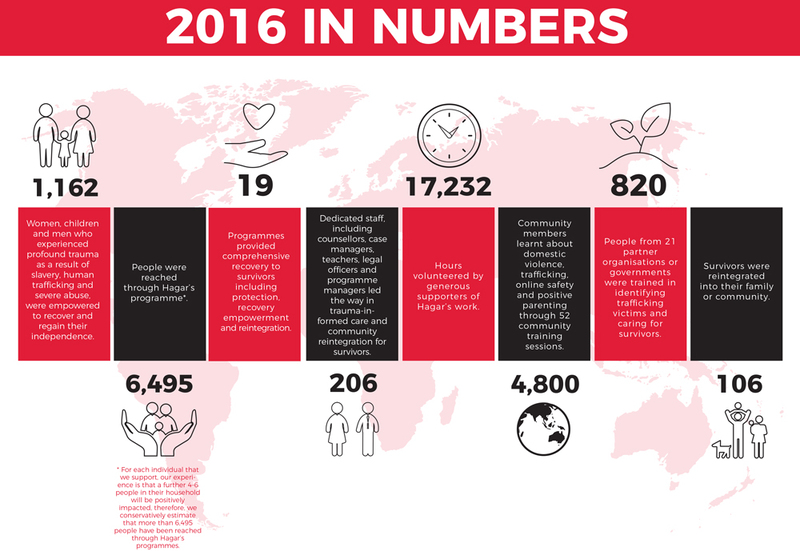 Local staff work closely with communities to empower them to change their attitudes and responses to slavery and abuse, in 2017 alone we trained 8,645 community members on topics like domestic abuse and trafficking awareness. The Hagar impact is created in partnerships with government and local leaders. We know that this means this impact will have longevity. We currently have training and research partnerships with governments in each of the countries we work in. The Hagar impact is global, with programmes in four countries across the world and support offices in six.